Chance The Rapper is undeniably the king of Chicago and he's making his way towards being crowned king of rap. He's an incredible human being…but this isn't really new news. He's an independent artist, his music is free and accessible, he concert tickets are affordable and sometimes even free if you live in Chicago. He's defied the music industry by winning three Grammys with no label and no formal promotion. So yeah, he's the man. But as you've probably heard, he does a lot more outside of making great music. In his recent single "I Might Need Security" he raps "They call me the advocate"…yep, we sure do, Chance The Advocate. He is single handedly saving Chicago with his advocacy for the young community and minority groups. We took an extensive look at Chance's resume, and the community service section is pretty damn impressive. Here's 14 reasons why Chance is the #1 human in Chicago. Chance recently announced via rap that he bought the local news publication, The Chicagoist, because he can. In a statement last Thursday, he said, "I'm extremely excited to be continuing the work of the Chicagoist, an integral local platform for Chicago news, events and entertainment," he continued, "I look forward to re-launching it and bringing the people of Chicago an independent media outlet focused on amplifying diverse voices and content." 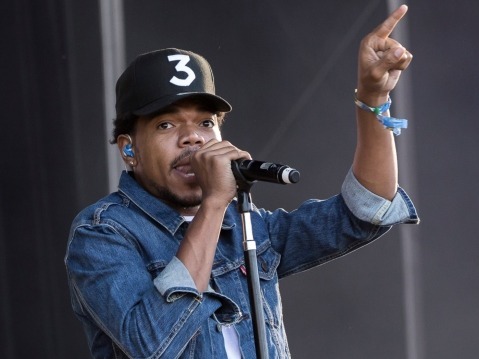 This past Saturday at Northerly Island, Chance partnered with the Special Olympics to put on a charity concert featuring himself, Usher, Jason Mraz, and more. "I haven't done as much work as possible with the intellectual and physical disabilities community," Chance said, "But overall we've been about access, just trying to make sure everyone is given their chance at greatness. And greatness isn't something segregated. When I looked into the history of the Special Olympics, that it started here 50 years ago and how many (Special Olympics) athletes we have in Chicago — 7,000 — I felt we should be a part of it." Chance announced recently that Chicago will host the first ever Twilight Awards in 2018. The awards will be for "teachers, parents, principals, and students that convey leadership." According to Chance, the show will be hosted by James Corden of the Late Late Show, and special guests will perform. Chance deeply values education and consistently emphasizes the importance of educating the youth, "Funding education is the most important investment a community can make," he said. He told the 2018 graduates of Dillard University to "Surpass your heroes and achieve greatness, just like Beyoncé did at Coachella"….epic. He was also awarded an honorary degree for his philanthropy and continued service to Chicago youth. 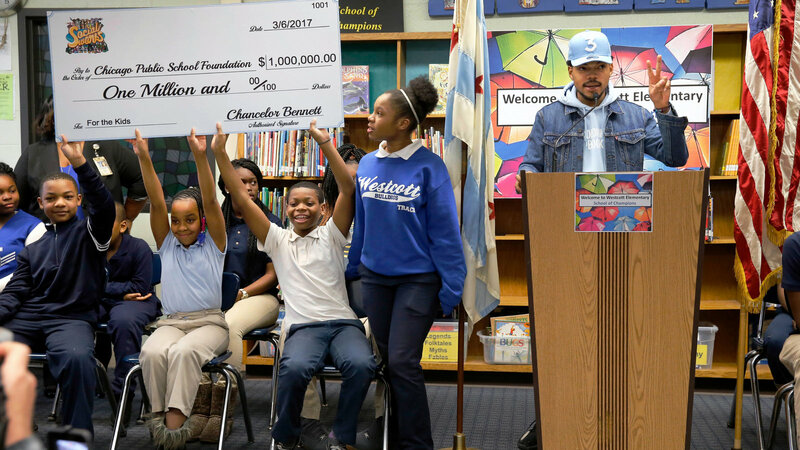 Chance has been giving back to Chicago Public Schools (CPS) consistently for many years now. In January of 2015 Chance, his brother and Sway helped to raise $100,000 for Chicago schools through the Get Schooled Program. The $100,000 went towards new technology equipment to help six local elementary schools. Now, Chance has his own charity called SocialWorks, a youth empowerment charity that has resulted in millions of dollars towards CPS. As many remember, last summer he wrote a $1 million check to the Chicago Public School Foundation to help support the arts in the school system. SocialWorks have done countless charity events to raise money for CPS and Chance is always at the forefront of the events. For example, he manned the grill and cash registers at a local Chicago restaurant to raise money for CPS and Chicago's youth. In June, Chance took the inaugural plunge down the Double Whirlwind at Great Wolf Lodge's new Illinois location. At the resort's grand opening, he joined kids from SocialWorks' summer program, called Kids of the Kingdom summer camp. He also accepted a $75,000 donation from the Great Wolf Lodge to fund another summer of the camp. Last summer Chance made the decision to bring a sign language interpreter on tour "to help everybody experience the show," and he encouraged fans to bring friends that are deaf or hard-of-hearing. "If you know anyone that's deaf or hard-of-hearing please invite them to the show—we just want to turn up", he announced in a video. In February of 2015, Chance started hosting bi-monthly "Open Mike" nights for Chicago youth in conjunction with the Chicago Cultural Center. He's still hosting them regularly and bringing out tons of big artists such as Kendrick Lamar, Childish Gambino, Kanye West, and Big Sean. He has also given away free unreleased Jordan sneakers to all in attendance. The event is always free to teens with a valid high school I.D….so we need a fake high school I.D. and a flight to Chicago ASAP. The event is meant to serve as a creative outlet for Chicago's young artists, as the event is where Chance began his music career. Check out this video of him performing at 17 years old. In February of 2017, he paid for an entire movie theater so that Chicagoans could go see Get Out for free. It's the little things. Chance and Barack Obama are both Chicago boys, and they go way back, before Obama was in the White House. In 2017, Barack Obama delivered an empowering video message to everyone at Chance's free surprise concert in Chicago. "We want to make sure our kids are safe, we want to make sure that they are ready to go back to school. We want to make sure that we are nurturing and protecting and encouraging and loving the next generation of leaders all throughout the city of Chicago. So Chance, I'm grateful for everything that you've done on behalf of the young people back home." Chance and Obama have teamed up several times, such as in this PSA for My Brother's Keeper Alliance, a nonprofit launched by Obama to work on "improving early childhood education, keeping black and Latino boys out of the criminal justice system, and on preparing young men to be more successful when entering the workforce." In November of 2016, the night before election day, he held a free show in Chicago, and afterwards, he lead hundreds of people to the voting polls. In 2015 he helped create one of a kind self-heating water resistant jackets for the homeless that can be converted into sleeping bags and over the shoulder bags, called EMPWR coats. The project successfully opened job opportunities for the homeless in the Chicago community. 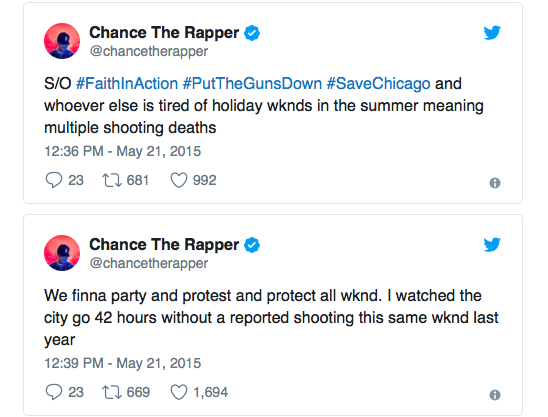 In May of 2015, for the second year in a row, Chance launched his anti-violence campaign aimed to silence violent activity during some of the most statistically violent times of year. He tweeted a list of events in Chicago to encourage "positive loitering" such as community sports, spoken word, and leadership classes. In addition, he had mass numbers of people out on street corners with posters and banners that said #SAVECHICAGO and radio stations saying "PUT YOUR GUNS DOWN CHICAGO" every hour. In July of 2015 surprised a group of 6-11 year olds by taking them to Chicago's Field Museum, where they got to see dinosaur bones and hangout with Chicago's best human. He's the chaperone we all wish we had.